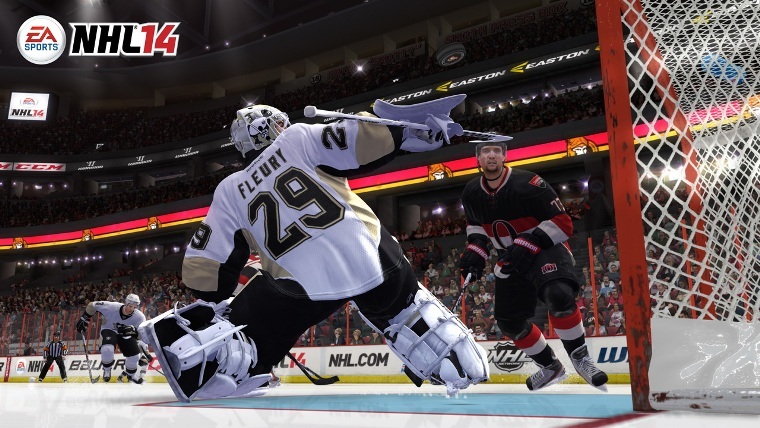 Review Fix chats with NHL 14 Producer Sean Ramjagsingh, who discusses the bevy of new additions and features in NHL 14. One of the company’s most beloved titles, Ramjagsingh believes the best hockey game in the world just got better, thanks in part to new one-touch deking and enforcer systems. Review Fix: With all the talk about how the IGNITE ENGINE will change next generation sports games in terms of graphics and animations, how is your team’s focusing on making the best looking and authentic current console hockey game? Sean Ramjagsingh: That’s a great question. For us, NHL14 had to be the best playing, best looking and most authentic game on this generation of console. 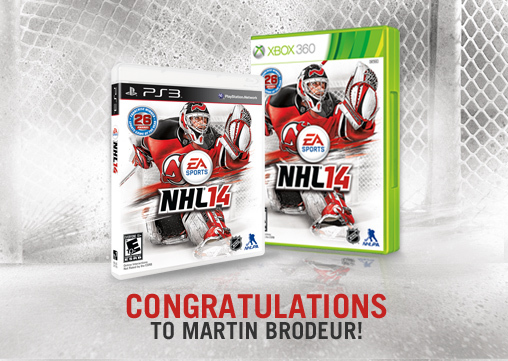 In order to achieve this, we sought out to leverage the best technology from within EA SPORTS and bring that over to NHL14 to deliver on Big Hits, Real Fights and Unbelievable Speed and Skill. For hits, we wanted to take our physics to a whole new level and to achieve that, we were able to leverage the best in class FIFA Player Impact Engine and make it meet our requirements for hockey. For fighting, we wanted to really capture the essence of why fighting is such an integral part of the sport and also give our users the most in-depth fighting system ever seen in a hockey game by leveraging the tech from our Fight Night series. The amount of depth, strategy and authenticity that the Fight Night fighting engine has brought to NHL14 is truly unparalleled in any hockey game to date. For speed and skill, we continued to build on our own True Performance Skating tech, which fundamentally changed the gameplay experience when it was introduced in NHL13. The focus here was to give the defense some added mobility to counter a lot of the work we did for NHL13, which favored the offensive players. Review Fix: How will the new enforcer engine change the game? Ramjagsingh: The new Enforcer Engine is all about being in the moment. Our old fighting engine felt like a one-off mini game every time a fight was started. The players on the ice and on the benches would disappear and you would end up in a 1st person camera view, which truly took away from the flow of the game. In NHL14, if you break the code of hockey by throwing a hit on a superstar or shooting the puck after the whistle, you can expect an opposing player to come over and want to fight you. Once engaging in the fight, there is a new 3rd person camera view where you can see all the other players pairing off. The Fight Night tech has allowed for unprecedented depth to the fighting as now you can punch and dodge prior to clinching up and once in the clinch, you can throw overhand punches and uppercuts plus dodge and tug your opponent to get him off balance. You also have the ability to throw devastating counter punches and occasionally get a one punch knock out. Review Fix: How influential will the one-touch deking system be? Ramjagsingh: We’ve had outstanding feedback on the new One-Touch deking system. To counter our new hitting system (NHL Collision Physics) we wanted to give users the ability to read that a player was stepping up for a big hit then react quickly to counter the big hit. Our older loose puck deking system (which is still there) makes it difficult for most users to quickly react to situations because it requires the two sticks and a bumper or L1. We wanted our users to have a simple but effective mechanic to pull off some cool dekes without having to rely on multiple buttons and that’s how the One Touch Dekes came about. What we’ve found is that the One Touch dekes have actually become a bridge for players that never used to do Loose Puck Dekes. The accessibility of the new dekes opened the door for users to continue to explore some of the more complex but more rewarding dekes. Review Fix: With a goaltender guaranteed on the cover, will there be any last second additions in development that emphasize goalies in the game? Ramjagsingh: Goalies are always a focus for us but with Martin Brodeur winning the cover, the first thing that we did was ensure that we captured his unique style of playing goal whether it be pad stacks or kick saves. Review Fix: What do you think is the best addition to the series this year? Ramjagsingh: That’s a tough question to answer…Our goal at the outset of NHL14 was to create the perfect balance of Speed, Skill and Aggression which the team has done a fantastic job of delivering against. If I’m forced to pick one feature, I’ll go with the new NHL Collision physics where you can now throw huge hits with just the left stick. The hits this year are EXTREMELY satisfying. Review Fix: What are the other additions in this year’s game? How will they change the fans can play? Ramjagsingh: This year, we’ve also added a new Live the Life mode. This mode now takes your Be A Pro experience off the ice as well. You will go through events such as pre-draft interviews, pre-game questions, post-game questions as well some interesting ‘situations’ that you need to action on. Your off-ice decisions will impact Management, Teammate, Fans and Family relationships, which all have positive and negative effects on the ice and off. 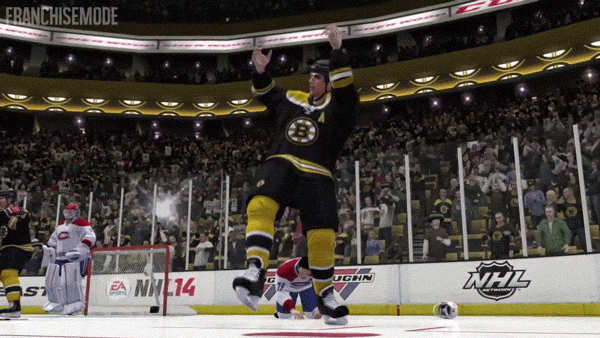 We’ve also added a new mode called NHL 94 Anniversary Mode. Our goal here was to recreate the NHL94 social experience that so many gamers had on the couch next to their friends. This is the mode you play when friends come over and you’re up for some friendly old school hockey competition. Review Fix: The fans of this series are super loyal. What have they asked the most for this year? Ramjagsingh: Better everything. In all seriousness, we truly do have some of the most loyal fans out there, which is why we put such a huge importance on maintaining a two-way conversation to hear what they want. Because we hear so much feedback, it would be unfair to call out one big thing that has been requested but I can call out some of the incremental improvements that we’ve made based on fan feedback such as better puck support through the neutral zone, more realistic goalies, new division alignment, faster screen transitions in GM Connected, post-game interviews for Be A Pro (now Live the Life) etc. Review Fix: Do you think you’ve delivered? Ramjagsingh: Absolutely. We are very proud of NHL14 and to get some external validation by winning the E3 Game Critics award for Sports Game of the Show really meant a lot to everyone that is a part of the NHL franchise. Review Fix: How do you want this game to be remembered in regards to the legacy of the series? Ramjagsingh: Best one ever delivered on Xbox 360 and PS3.